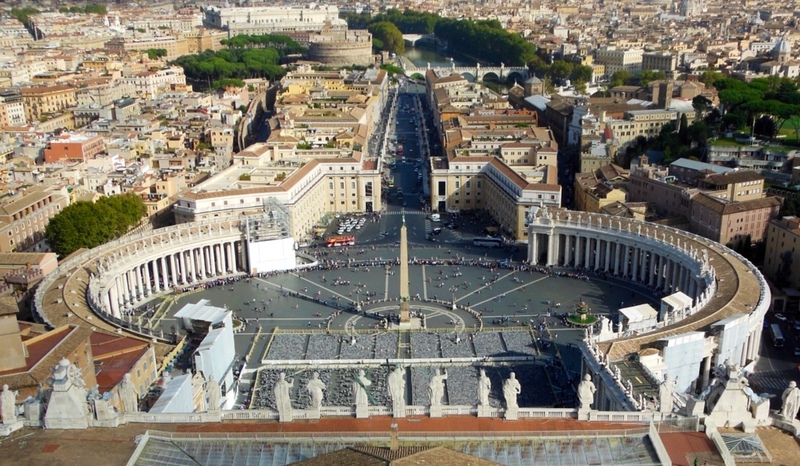 It is quite a climb at the Vatican to the cupola of St. Peter's Basilica, but the view is worth every step. The lines at St. Peter's can be quite long, but there was a break at lunchtime today. Take off your hat when you enter church, especially St. Peter's. Guess who did not? Dinner hour here for many diners is about 9 p.m., when you can feel the city energize. The meal pace is slower than in California…much better here! You must ask for the check when you are ready. Some diners smoke at outdoor cafes, but it is usually not bad. Many drivers and passengers do not wear seat belts. This is a walkable city. The food is terrific and we are looking forward to specialties of other areas of Italy. We have had mainly pasta, pizza, calzone, risotto, and panini here. The bruschetta is a great appetizer. Most drink red wine here and we did not splurge for the expensive stuff, but what we drank was mostly good, particularly after the first glass. We have loved the maze of narrow streets and the incredible number of eating and drinking places. Smart cars are everywhere, but they park at stupid places and angles. I have no idea how people get out of their parking spots. But, I usually cannot figure out how they got into them! Be sure to get your train and bus tickets validated…there are machines at the train stations to do so, and yellow machines on buses. You can be fined if you forget. It is easy once you get the hang of it. Sue advises not to try your high heels on the cobblestone streets. We did pass several hospitals on our walks, though. I am so glad we chose Italy for our first retirement adventure.